Apartheid is a loaded but only minimally inappropriate label for the deliberate separation of Israelis and Palestinians on the West Bank. This separation is accomplished partly by self-selection by the people themselves, partly by the command of security forces, but largely by the elaborate development of separate infrastructures, especially roads and signs. 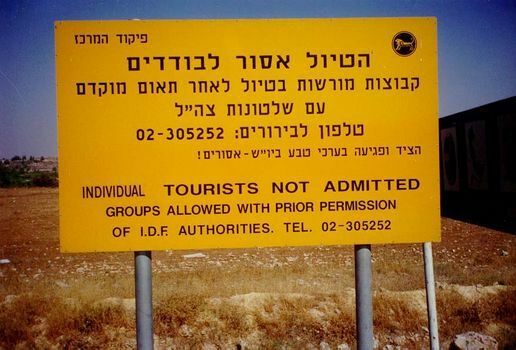 A cautioning sign found at all the entry points to the West Bank. At least when these pictures were taken in the 1990s, the policy was not enforced. 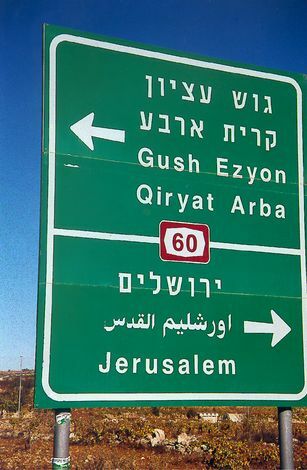 Road signs often identify Israeli settlements but ignore Palestinian towns. Here, there is no mention of Ramallah, to the right, or, at least in English, of Nablus to the left. Instead, the Israeli name for that city (Shekhem) is used. An even better example: no mention of Hebron to the left but only of Israeli settlements. 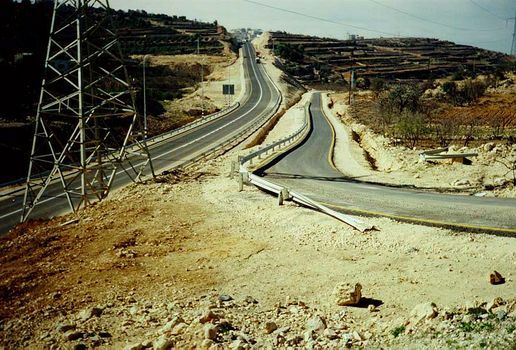 Near Ephrata, a Palestinian road is kept separate from the main highway being built for Israelis travelling to Jerusalem. Here at Halhul, north of Hebron, an Israeli highway heads west to the coast. 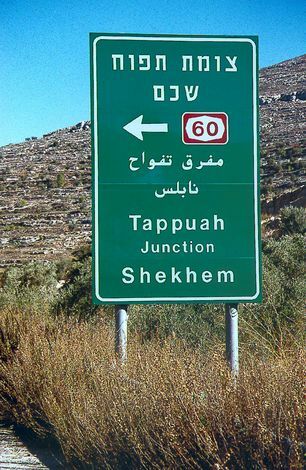 A Palestinian village called Beit Kahil lies off to the north, at the far end of the one-lane road separated by guard rails from the highway. Why not start the village road from a point farther down the highway? Why this curious parallelism? 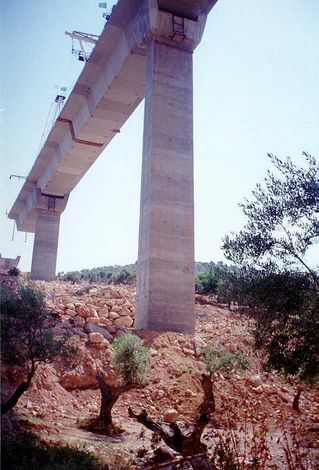 The answer is that the highway passes at the left through an underpass atop which runs the main road through Halhul. By giving the Palestinians their own road network, and building a separate network for Israelis, preparations are laid for a future in which the two peoples can live apart. The construction of the underpass mentioned in the previous picture required some excavation. 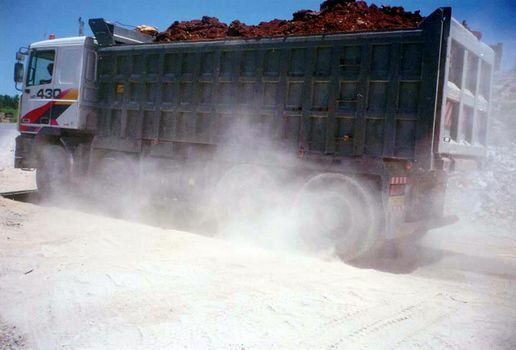 The landowner whose orchard was being destroyed by the excavation hired trucks to haul away his topsoil. 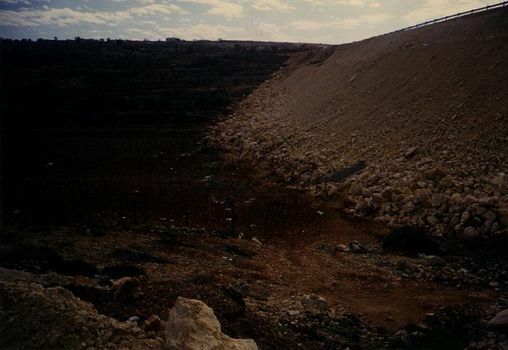 When the Israelis returned his land to him, he had the topsoil trucked back, and he replanted his orchard. 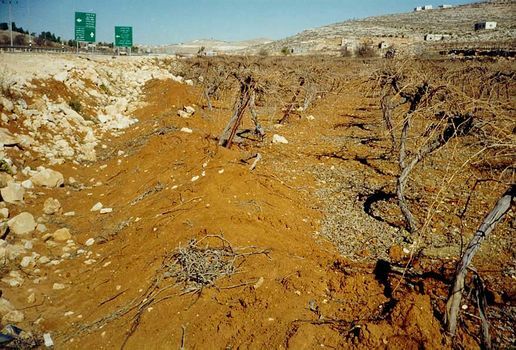 A few miles away from the site of the last picture, the Hebron bypass road passes atop a huge fill dumped in a valley that had been solidly planted to vines. On the east side of Hebron, a new bypass road cuts through vineyards. Here, the trellis cables have been cut, and the vines are sagging. The owners say that they received no compensation. 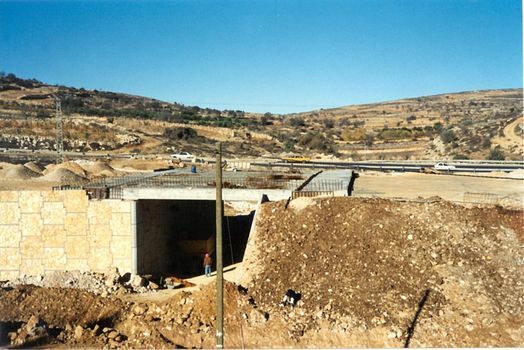 This immense bridge at Beit Jala, west of Bethlehem, carries an access road from Jerusalem to the southern settlements. 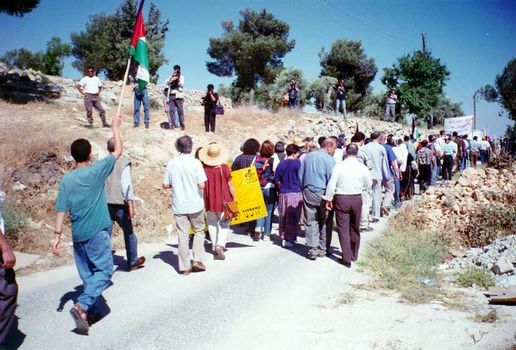 A procession sets out from Bethlehem to protest the confiscation of land for a security road on the north side of the city. Turnout was light and the mood fatalistic. Construction did not stop.